25. Excessive or lustful kissing, particularly when one character or the other is a "heavy". the above text is cited from Gerald Mast (ed. ), The Movies in our Midst: Documents in the Cultural History of Film in America , The University of Chicago Press, Chicago, 1982, pp.213-214. Starting at certificate number one in the year 1934 (The World Moves On), in the opening credits of most USA released movie films from the year 1934 until the year 1968, the certificate number meant that the movie film adhered to the Hayes Office "Motion Picture Code". 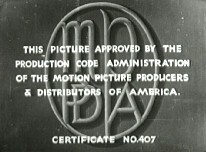 Initially displayed as a whole frame title card with these words "THIS PICTURE APPROVED BY THE PRODUCTION CODE ADMINISTRATION OF THE MOTION PICTURE DISTRIBUTORS OF AMERICA" and then later the certificate numbers were displayed (without the above statement) below a stylized oval at the bottom of the screen, always with the stylised letters "MPPDA" (and then later with) "MPAA" within that oval, and then the "CERTIFICATE NO." and a number. 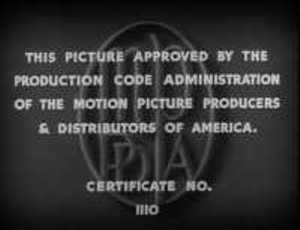 MPAA film numbers (certificate of approval) - For each movie film, displayed on screen at the end of the credits of every USA released movie film, the Motion Picture Association of America (MPAA) has issued a unique number to identify the title. Since the MPAA movie rating scheme started in 1968, each movie film displays a stylized Mercator globe, with a film reel in the middle. Above that is the certificate number and below is shown the name, "Motion Picture Association of America".